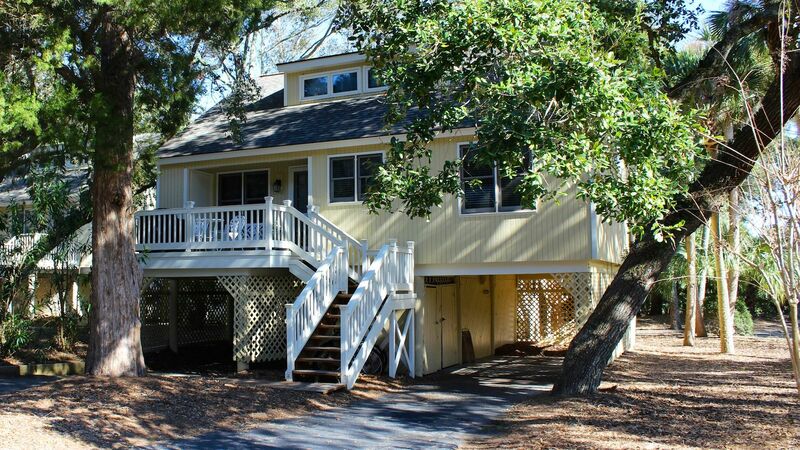 550 Tarpon Pond is a charming beachy cottage! 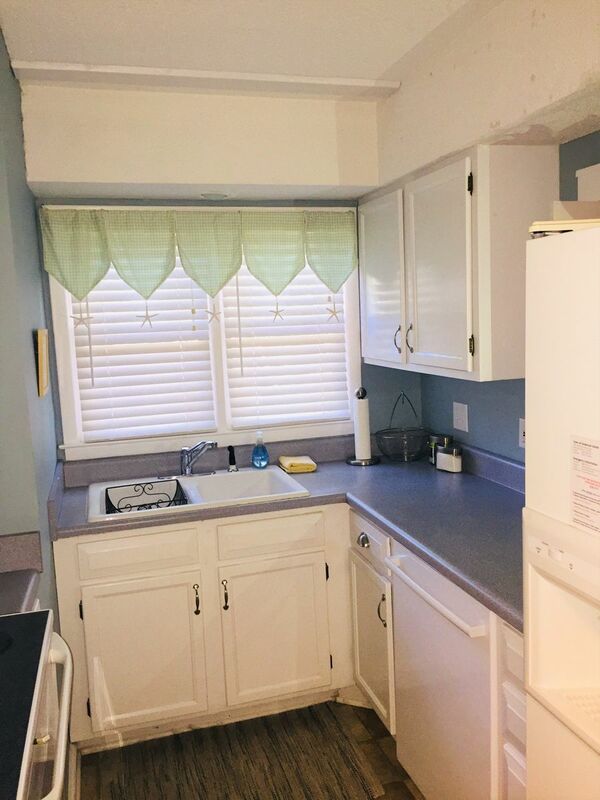 So close to many of Seabrook's amenities yet nestled on a quiet street amid Seabrook's majestic live oak trees, it is the perfect quiet retreat for your vacation. 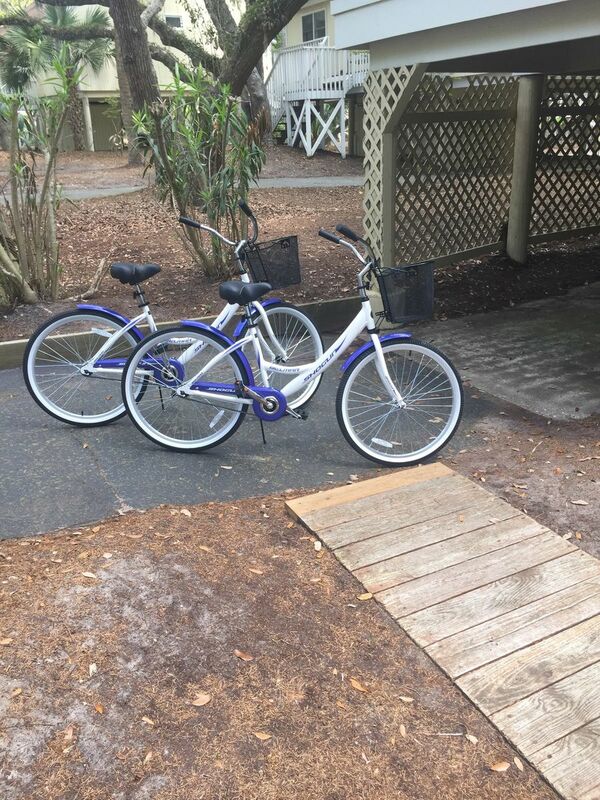 Located .8 miles to Pelican Beach and 1.2 miles to the Beach Club pools, Pelican's Nest oceanfront, outdoor dining, clubhouse, and golf courses, you are just a bike ride away from so much. Surrounded by mature trees, you can sit and watch the wildlife while sitting on the screened porch. This inviting and cozy cottage is perfect for family vacations! 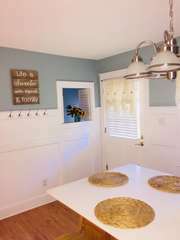 The cottage features an open dining/living area with cathedral ceilings and hardwood floors. Wainscot paneling, high ceilings, and a fireplace create an airy atmosphere. Enjoy watching shows on the HDTV/DVD. 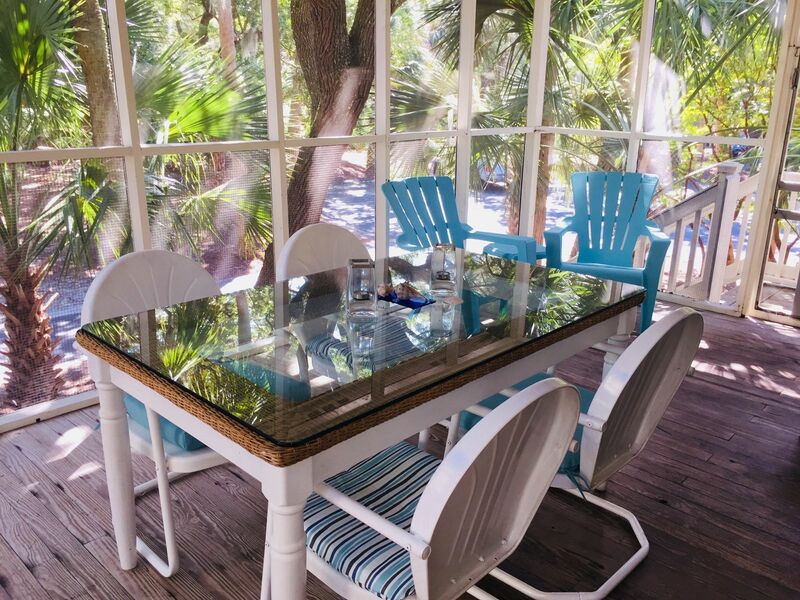 The sliding doors to the screened porch where sunlight filters through the trees creates its own relaxing space as you sip cool drinks and unwind from a fantastic day at the beach! In the dining area, your friends and family can gather around the island table that seats 8 on bar stools - perfect for sharing stories from your day. 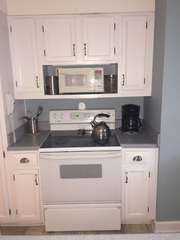 The nearby galley kitchen has white cabinetry, Corian counters, new dishware, and is very well stocked. 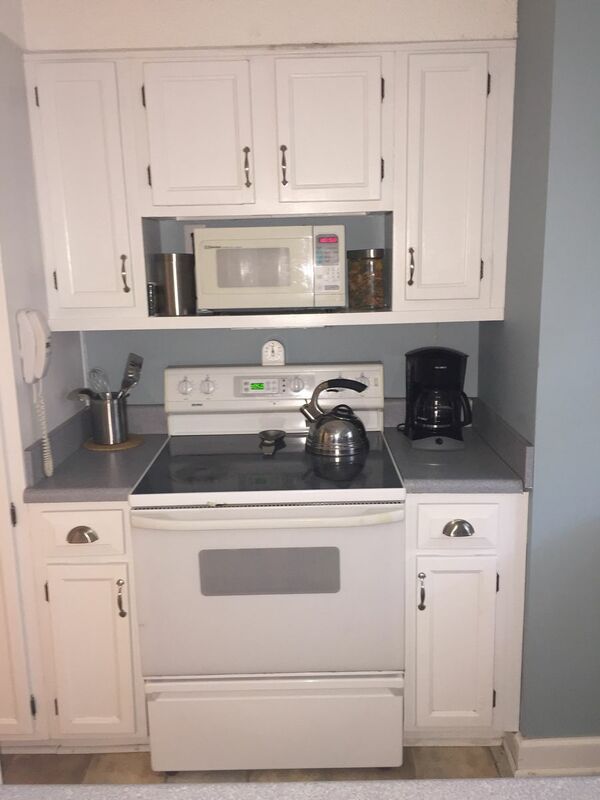 There are three bedrooms in this cottage. The master bedroom has a queen bed, an HDTV, and its own adjoining bath with a shower. The 2nd bedroom has two twin beds with trundles and an HDTV in the armoire. The hall bath with a shower/tub is just outside the door. Upstairs is a large loft with two twin beds. This is a great retreat for the children. 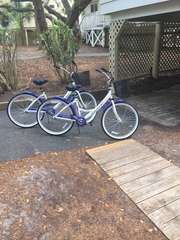 This beach island getaway also has two adult bikes, beach chairs, beach towels and a grill for all to enjoy. 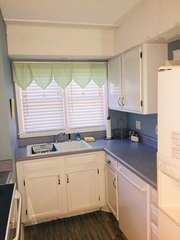 This lovely cottage is so close to all Seabrook offers. The Beach Club pools, Island House restaurants/bars, and golf are only 1.2 miles from this home. 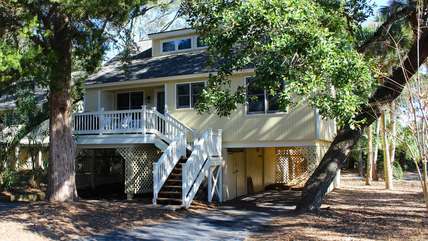 To play tennis or lounge by the Lake House pool, head the other way down Seabrook Island Road to the Lake House and Tennis Center. Amenity cards giving you access to the facilities of the Seabrook Island Club, are included in the rent. These cards give you access to the oceanfront pools (seasonal), Pelican’s Nest outdoor restaurant/bar (seasonal), Island House restaurant/bar, golf and tennis. Additional fees are charged for all activities except outdoor pool usage. Your dog is invited to travel with you, and the cottage has bowls for your furry friend to use. Please add a pet fee for each dog accompanying you. You and your family and friends will totally enjoy relaxing in this great cottage.